I suggest you use the finest ingredients you can to make these because it adds to the “deliciousity”. That said, no one will refuse them if you use supermarket butter and cream. Prepare 9” x 9” pan by lining with parchment paper and generously spraying with cooking spray. Warm cream with the vanilla (If using a vanilla bean, split the bean in half lengthwise. Steep it in the cream. Then scrape the seeds into the cream and discard the pod) and the salt. Set it aside with a small strainer ready to pour it into the caramel syrup. Cut butter into small cubes and have it ready to be added to the caramel. Place sugar, water and corn syrup in heavy bottom saucepan (I used a 3 quart saucepan, but a 4 quart saucepan might be a little less scary) and heat it on low flame, stirring gently to melt sugar, being careful not to splash the sugar mixture around. Use a damp pastry brush to wash sugar crystals down the sides of the pan, if you see sugar clinging to the sides of the pan. Once the sugar is melted, raise heat to medium and cook the mixture until it begins to turn golden colored and then caramel colored, approximately ten minutes. BE VERY CAREFUL not to take it too far or the caramel will be burn. Take it off just before you think it’s ready. Remove from heat and add butter and strained cream. THE MIXTURE WILL BOIL FURIOUSLY—don’t be scared—it’s kind of exciting! Stir with a silicone spatula to completely mix in the butter and the cream. Return the mixture to the stove on a medium heat and carefully add the candy thermometer to the pot making sure the end of the thermometer is NOT touching the bottom of the saucepan. Bring mixture to 250°F, remove from heat and immediately pour into prepared pan. Cool for 20 hours. 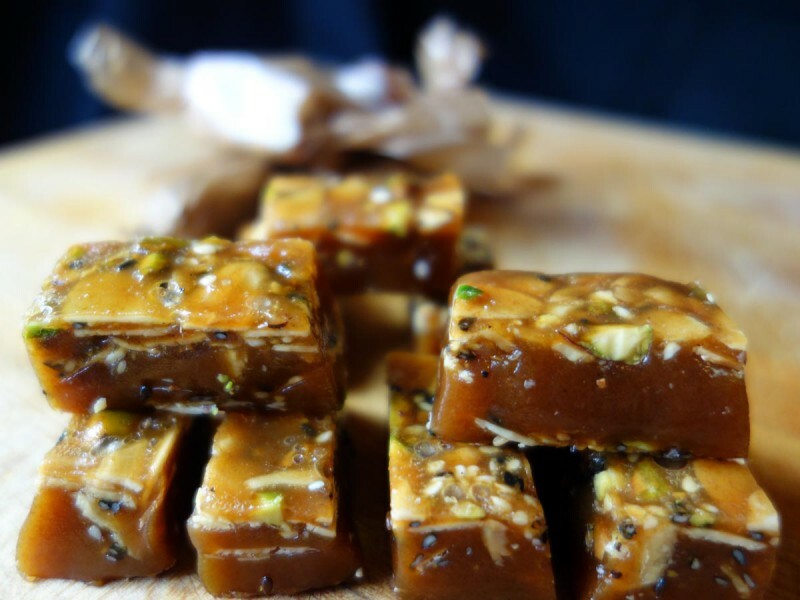 Gently remove the parchment paper and slice caramel into 1” x 1” squares. Wrap caramels in waxed paper or cellophane paper. Store in an airtight plastic container, in a cool spot. What I love about them is the versatility of the many ways to flavor them once you have a solid base recipe. Chocolate: I poured tempered chocolate on the cooled caramels. You could also cut the caramels and dip them in chocolate. This is a lot more more work, but then you can sprinkle stuff on top like toasted nuts and dried fruits and caramelized crisped rice. You can also add cocoa powder to the cream to make a chocolate caramel. I did it, but I didn’t measure. I’d guess about a 1/2 cup. Beer: Reduce a 12 oz bottle of beer down to a syrup and add it to the cream. Sesame: Add 1/2 cup of toasted sesame seeds. I used both black-and-white ones and they looked amazing. I poured the caramel on top of the sesame seeds in the prepared pan. Cardamon: Empty six cardamom pods, grind the seeds and infuse them into the cream.